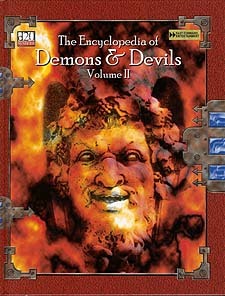 Demons and devils of legend walk the planes! * Mankind's history provides us many legendary demons and devils of amazing power. Their histoircal abilities have been translated into d20 powers and abilities thast will serioulsy challenge player characters. * Prestige classes for the damned and nearly damned. Many of the demons and devils have divine natures. These ultra powerful creatures naturally give some of their powers and skills tothose who slavishly worship them. * These outsiders have brought with them some serious magic items. Weapons, bracelets, and rings are just a few of thenew treasures you will find. Funny thing about these devices: when the outsider is banished back to its original plane, all these nice magic items just fall to the ground. Have you the courage to pick them up?